The California Department of Education (CDE) released statewide chronic absence data in December 2017 via DataQuest, an interactive data portal. 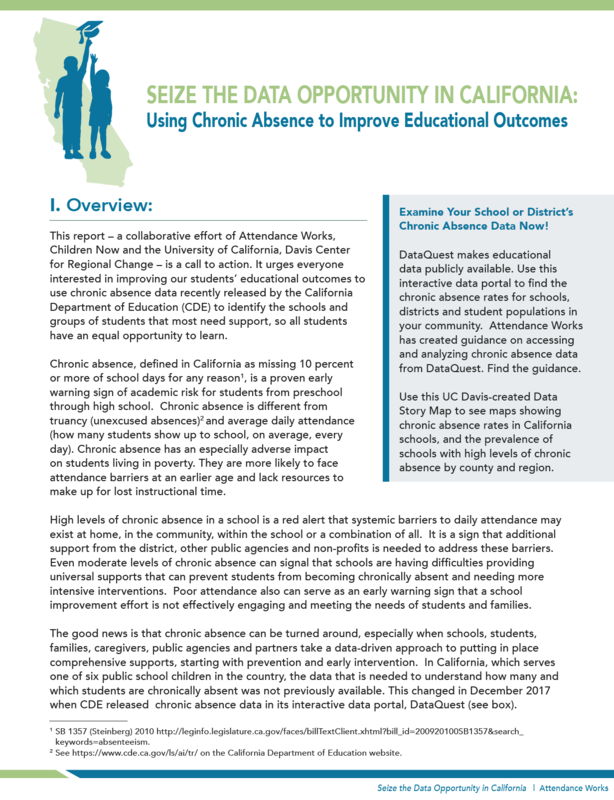 To better understand chronic absence at the school level, Attendance Works collaborated with the Center for Regional Change at UC Davis and Children Now to analyze the data available from DataQuest and other CDE datasets. The analysis looks at how chronic absence varies across different types of schools, and how it is distributed geographically. It also examines the connection between school-level chronic absence and educational outcomes for schools. The report closes with action recommendations for key stakeholders. While this report is focused on California, it is relevant for other states because it demonstrates how publicly-available chronic absence data can be used to inform the allocation of resources and to alert key stakeholders when collective action is needed to address barriers to attendance.